Hate Crime Legislation: Does it Work? Can the Democrats Build a Progressive Movement Against Trump? Kim Brown:	Welcome to the Real News Network in Baltimore, I’m Kim Brown. Another activist connected to the uprising in Ferguson, Missouri following the shooting death of teenager Mike Brown by police, has been found dead. Take a look at this photo. This was taken the night of August 11th, 2014 and it shows a man named Edward Crawford Jr wearing an American flag tank top, picking up a burning canister of tear gas fired by police and throwing it. He later told reporters that he threw it away from children who was standing nearby. According to the St. Louis Police, 27 year old Crawford was found dead last Thursday of a self-inflicted gunshot wound while riding in the back seat of a car. His father told the St. Louis Post dispatch that he thought that his son accidentally shot himself. He did not think that he was suicidal. Edward Crawford Jr leaves behind four children. This makes the third such mysterious death in as many years of an activist connected to the Ferguson protest and uprisings. In September of 2016, activist Darren Seals was found shot inside of a burning vehicle. Police have ruled that a homicide which still remains open with no arrests. 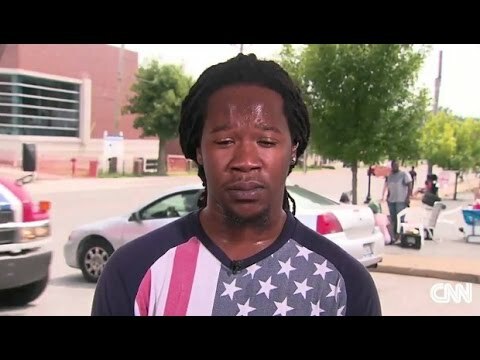 Another man, 20 year old Deandre Joshua was also found in Ferguson, shot, also inside of a burnt out car in November of 2014, which happened to be on the same night that grand jury declined to indict Darren Wilson, the admitted killer of Mike Brown. This begs the question, because many in the St. Louis area and throughout the country are really doubtful that these deaths are coincidental. In fact, the long history of the struggle, of the fight for civil rights for African Americans, which ranges from the abolitionist movement, to Black Lives Matter today, many leaders and participants have been either flat out assassinated, or died under unusual circumstances and it really clarifies and illuminates how the struggle for equality and freedom can literally cost you your life. Well, to discuss this, we’re joined with Glen Ford. He’s the executive of the Black Agenda Report. He’s also the author of the book titled The Big Lie. He joins us today from New Jersey. Glen, thank you so much for being here. Glen Ford:	Thanks for having me. Kim Brown:	Well, Glen, as I’ve mentioned in the intro, there a lot of unanswered questions, surrounding not only the death of Edward Crawford, but of that of Deandre Joshua and Darren Seals before him. What is your take on this sort of spat of mysterious deaths of those connected to Ferguson and how this ties into a longer history of activists losing their lives? Glen Ford:	Well, certainly, we’re not a case of mass black paranoia, and to point that up, even the St. Louis Police believe that there was a connection between the deaths of Seals and Joshua, who were killed in almost exactly the same way. You can’t make up the similarities in those killings, but of course, the St. Louis Police have never brought a case. If we’re talking about just the death of young black men, not even young black activist men, who are in the public eye and whose faces are known as Crawford’s face was known, his whole visage was iconic and known to millions of people around the world and in fact, it was the image of the Black Lives Matter movement. But let’s just talk about that demographic, young black men. If any other demographic or sub-demographic in the United States was dying under all kind of circumstances but most dramatically, violently, at the rate that young black men die, there would be a cottage industry of books and other media that would want to get to the root of this mystery. But when it’s young black men, people just think that’s normal. Well, these were young, political black men who were operating in a sea of not just police repression, but also a state that used to be a slave state which is infested, Missouri, infested with white supremacist militias, many of whom live very much nearby Ferguson, Missouri. There are plenty of suspects and plenty of similarities and plenty of reasons for black folks to think that young black activists are on somebody’s hit list. History certainly is replete with the victims of racist oppression, in and out of uniform. Kim Brown:	In the land of Constitutional rights, the First Amendment to free speech, the right to assemble, the right to religion, et cetera, why is it so dangerous for activists, particularly activists of color, black activists, to be on the public platform of advocating on behalf of civil rights? As you mentioned, some of these gentlemen were not famous, necessarily, they certainly weren’t household names, but they were still present in the movement and present in the struggle. Even if you’re not a Jesse Jackson or a Deray McKesson, you can still be vulnerable for these types of things to happen if you’re simply even involved. Glen Ford:	You in fact are more vulnerable because you’re not surrounded by an entourage. You’re not constantly under media attention and your part, and this is the most important aspect, you’re part of a group that dies in violent ways all of the time. That this kind of demise is considered normal, so the crime won’t be seen as a crime and prosecution is very, very unlikely. Cops, of course, know this better than anybody else. Kim Brown:	Speaking of police here, Glen, again, if we’re looking at this from a historical perspective, which is usually the prudent thing to do, the police historically have been complicit or have been directly involved with the murders of African American activists. Those who have been pushing for equality of rights, be it voting rights, be it pay equality. The police have usually been there and not always in the way to best seek justice. Talk about the role that law enforcement has played in silencing voices of the struggle. Glen Ford:	The police understand their mission. They’re indoctrinated into their mission by the state. We’re not talking about stray white folks acting out their own personal prejudices and that leading to random acts of violence against black folks. What we’re talking about here is police as an institution whose mission, it’s very, very clear to them, is to contain and control the black community. That requires the use of terror. It requires that it be re-enforced daily. That the police have a monopoly on the use of deadly force and you have to use that deadly force on occasion in order to let people know that you have it. The people that you want to let know that you have this monopoly on deadly force are those who challenge it. People like folks who get in iconic photographs, like Mr. Crawford. Kim Brown:	What do you think that we can learn, or those who are in the movement, in the struggle, can learn from the very tragic and untimely demises that have come for people before this time? We live in an age of technology and social media, I mean, do activists need to constantly disclose where they are, what they’re doing? Or maybe even tweet out, “Hey, I’m not suicidal.” Just in case they get arrested or taken into custody and they are found dead for whatever reason. I know it sounds like a bit of hyperbole, but it really isn’t because these things have happened and they have been happening for a long time. So what can people who are advocating on these fronts do to protect themselves, if anything? Glen Ford:	Well, you know, you’re asking me a very dangerous question and if I gave you my honest answer, then that might put me on a kind of list, not a list from stray policemen, or white militia men, but from our government and our police agencies. You counter attacks upon your community and the important people who made themselves targets in your community because they’ve stood up for that community, you counter that kind of violence against you by creating a situation in which the perpetrators pay a price. So if you suspect where the violence is coming from, you demonstrate that a price must be paid. But if I speak any further on this, I think that I might be indicted, especially with this new administration which interprets free speech according to it’s own set of rules. Kim Brown:	Indeed, well, Glen Ford, we will leave the rest of that unsaid. We appreciate you joining us today. Kim Brown:	We’ve been speaking with Glen Ford, he is the executive editor of the Black Agenda Report. He is also the author of the book titled The Big Lie. My name is Kim Brown and I appreciate you joining us right here, on the Real News Network.